Oil and gold on canvas, 40x70 cm. nor whether I was born here or abandoned. A dark and silent sea surrounds me. Around me white bones glisten in an eternal noon. Nothing stirs on the bleak shore. Shipwrecks and sailors' corpses rot. and know my song is not alone. and the future, but I lie. The ship is deftly brought to shore. your swollen tongues will not crave liquid. forget your wives, your children, and life itself. perhaps in that black ship now approaching. What's this? It sails by! Does my voice no longer charm? Did I not tame even crude Centaurs with my song? and makes me like the monstrous beast whose icy screams* call my shining queen up from the deep? And so she stared for the last time into the empty distance and threw herself down from the rock to go adrift. They say the waves of the sea carried the soaked plumes to a harsh land of sun. There someone built a tomb, but no one remembers where. * – the author used "tibia" in the original and tells me that “in traditional iconography the siren is often shown playing a flute called the "tibia" in Italian. It is common to use the Greek word "aulos" in English; it was an ancient Greek wood-wind with one or two tubes or pipes, resembling and held like a modern oboe or clarinet and played with a reed mouthpiece (and, thus, not really a flute). 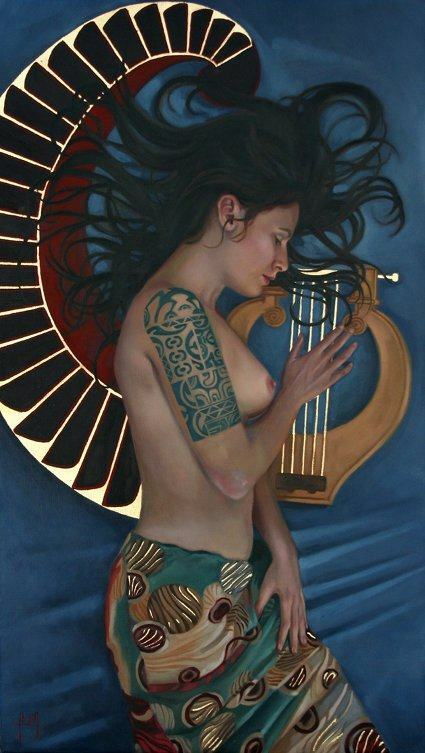 To fit the painting, I took the liberty of changing the instrument to "lyre". * “monstrous beast” is a reference to one of the Gorgons, Medusa, the sight of whom would turn an onlooker to stone. “Shining queen” refers to Persephone (the daughter of Zeus and Demeter, abducted by Hades to be his queen in the Lower World). Ovid tells us that the sirens were companions of Persephone.